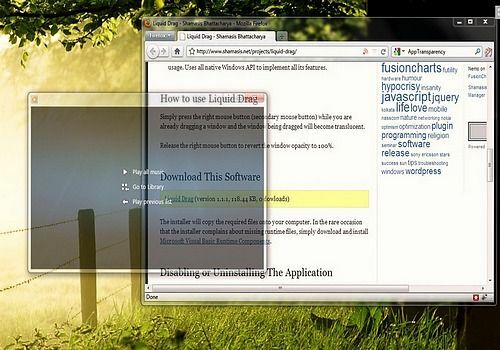 Unlike other Windows window customization tools, Liquid Drag offers to adjust the transparency of your windows. The application has been designed with the aim of offering users the ability to look through the active window. Gone are the days when you had to use the Alt+Tab combination to switch to another window, now you can have a better overview of all your windows. Don't worry, the reverse path is also possible with the opacification of your window via the right click. It is important to note that the Liquid Drag program only works with the combination of clicks (left click pressed: transparency, right click: opaque) in order to disturb the user's work habits. A Windows 10 theme integrating no less than 17 images of Christmas trees. Change the look of Windows 7 or 8 with this Stardock software, which offers you the possibility to customize the OS to your liking.